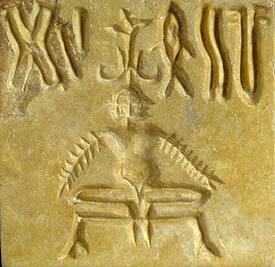 But the most important fact for our investigation is the discovery at Mohenjo-daro, of an iconographic type that may be considered the earliest plastic representation of a yogin. Here, the Great God himself, in whom the prototype of Siva has been identified, is represented in the specifically yogic posture. Sir John Marshall describes the figure as follows: “The God, who is three-faced, is seated on a low Indian throne in a typical attitude of Yoga, with legs bent double beneath him, heel to heel, and toes turned downwards. … Over his breast is a triangular pectoral or perhaps a series of necklaces or torques. … The phallus [is] seemingly exposed, but it is possible that what appears to be the phallus is in reality the end of the waistband. Crowning his head is a pair of horns meeting in a tall head-dress. To either side of the god are four animals, an elephant and a tiger on his proper right, a rhinoceros and a buffalo on his left. Beneath the throne are two deer standing with heads regardant and horns turned toward the center.” One of the most recent writers to express an opinion on the question, Stuart Piggott, writes: “There can be little doubt that we have here the prototype of the great god Shiva as the Lord of Beasts and the Prince of Yogis; he may have been conceived as four-faced, and with his four animals looks to quarters of the earth.